From the very opening count of “If I Could”, the two different genre’s of music birth an amalgamation of sound on All 6’s And 7’s. The bass drops, the samples skip, Stephen Carpenter begins strumming at his electric guitar, building a perfect target for the lyrical gunfire Tech has loaded & waiting. 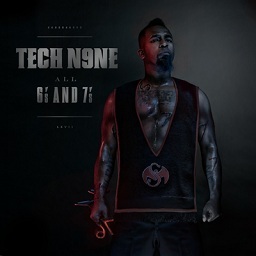 As the snares kick in, Tech begins to illustrate his absence of normal life in favor of being a musical artist, cutting into his classic Tech-multi rhyme schemes. The emotions are energetic as ever in this track, explaining the pride and struggle that comes with being a road warrior. The way Tech travels over the rhythm of Stephen Carpenter’s riff, creating a powerful, melodic flow — allows the listener to comprehend such a clear image of the visuals Tech brings lyrically, empowering listeners with a sense of positive aggression (redundant, but true.) Half way through the first verse, Tech begins to cut back and forth between a normal count and double time. Seven’s production adds another layer of distinction to this already stunning track. As the first verse comes to a close, Chino Moreno, lead man of The Deftones, sings from the heart as he explains the theme of the song, the hardship of being an artist on the road, the people that are left behind, and the pain of being selfish vs. selfless. This theme carries through the next two verses — the needs we have, the emotional obstacles of climbing to the highest point gravity will allow. Tech N9ne finishes the track with a promise to fans, a promise that he’s trying his hardest to leave his own footprints everywhere in this world, and with more hard work, he’ll get there. A brilliant matching, a flux in new music, sure to help crossover appeal. The immense fanbase that lies in the median of both rap and rock will be banging their heads for months, if not years to come. This link once again shows how versatile and universal both Tech N9ne, & The Deftones truly are. “If I Could” was produced by Seven.